KAMPALA-The state prosecutor at the Makindye based General Court Martial (GCM) has closed his case against the patron of Boda Boda 2010 Association, Abudallah Kitatta with four witnesses. This after Maj. Rapheal Mugisha the lead prosecutor informing court that having perused the evidence of the remaining witnesses; he realised that it’s not directly related to the case and therefore it will be of no significance to present them. 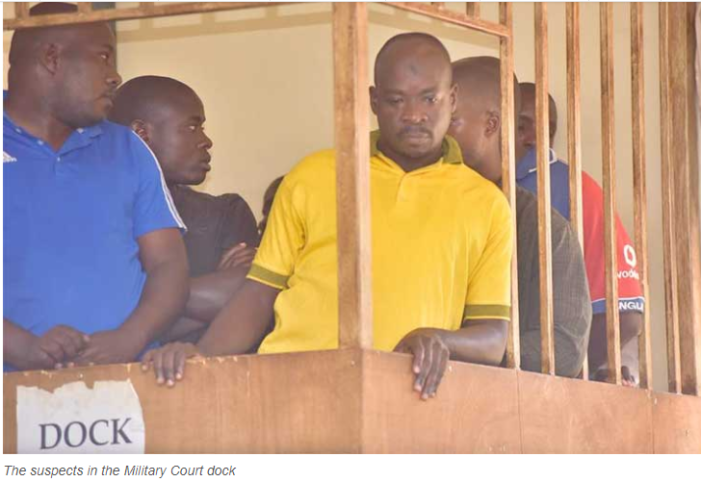 The four witnesses adduced in court are serving UPDF officers attached to the Directorate of Chieftaincy of Military Intelligence (CMI) and they include; Private Richard Kasaijja, Corporal Richard Wanyama, Maj. David Agaba and a Driver Cpl Alex Baguma. All the four witnesses told court that Kitatta was arrested from a Hotel Room in Wakaliga with 2 guns including a golden pistol and an AK47, 55 live ammunitions plus Military uniforms and caps that were got from his offices of Boda-Boda 2010. However, after prosecution closing its case, Defence lawyers led by Shaban Sanywa have informed the court’s chairman Lt. Gen Andrew Gutti that they will file submissions in court stating that prosecution has not proved charges against their clients. After the said submissions are filed on November 26, 2018, the 7 member court will now make a ruling on whether a pre-mafacie case has been made out by the prosecution to warrant the suspects be put on defence. Kitatta and 12 others are charged with 5 counts relating to unlawful possession of firearms, ammunition and Military gears. They have now been taken back on remand at Makindye Military police barracks and Luzira prison respectively; where they were remanded since February this year.